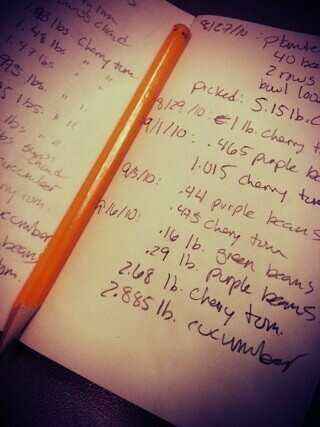 I’ve tried a variety of ways to keep up with my harvest calculations. My favorite way is to use a little Moleskine. It gets ported around the house, and can frequently be found resting on the kitchen counter or on the side-door steps. It’s also ideal for noting plantings and making diagrams. I like that I’ll always have a diary of my garden’s history. And no, that’s not a typo: I did pick more than 27 pounds of CHERRY tomatoes. How do you keep track of what you pick and how you plan? Caroline, I have tried everything from simple notebooks to extensive databases that I have created. The system that has worked the best so far is a simple composition notebook. They are portable, durable and hold up well when left outside or in the greenhouse. I will have to try the moleskine, I was looking for a small notebook without lines asI like to sketch diagrams in it as well. Nice work on the blog. It is nice to see others with the same desire to grow their own food organically! Rob, often it’s the simplest solutions that are the best, right? Thanks for reading!